While there has to be a level of functionality to your wedding invitation, you need to provide your guests with the invitation they need to know about the big event, there is a lot that can be down with respect to the style of your invitation. A lot will depend on the nature of the bride and groom and the style of wedding that they want to event but an intricate and stunning design is often the ideal way for many couples to announce the details of their big day. 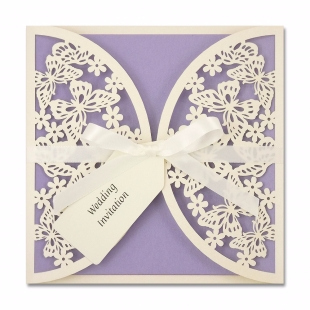 Any couple looking for a stylish and attractive wedding invitation, with enough functionality to ensure that your guests will arrive, has to consider the butterflies laser cut with satin bow wedding invitation from Pure Invitations. With information provide on the small luggage tag, this is also an ideal wedding invitation for couples planning a destination holiday, or who are looking to set off on an adventure once the ceremony and celebrations have passed. Whether this is an adventure with respect to travel or just the great adventure of life as a married couple, it doesn’t matter, because the card works on many levels. It can be difficult to find the words and emotions to sufficiently describe the way a bride and groom feel about each other but the notion of butterflies, fluttering optimistically, is an ideal way to get across the sheer joy and happiness that a couple experiences in the build-up to their big day. The stunning butterfly design sets this scene, and if you are looking for style and functionality, you will find this invitation provides you with everything you could need.